Figure A21. Caribbean anomaly, interpreted as the Caribbean slab, with (horizontal) [vertical] cross sections through (A)[D] the UUP07 p-wave) and (B)[D] the combined SL2013 and S40RTS s-wave models at 370 km; C) the location of the modern geological record that we interpret to have formed during the subduction of the slab. The Caribbean anomaly (Figure A21) is located in the upper mantle below the eastern Caribbean Sea up to the surface at the Lesser Antilles subduction zone where Central Atlantic oceanic lithosphere subducts westward. The anomaly is interpreted as a slab dipping steeply westwards from the surface to a depth of 600 km, changing to a sub-horizontal position below this depth (van der Hilst and Spakman, 1989; van Benthem et al., 2013) . The base of the slab is at least 45 Ma old, as shown by the ages of onset of the Lesser Antilles arc (Burke, 1988), and the Paleocene Grenada and Tobago basins may have formed shortly after initiation of subduction along the Lesser Antilles subduction zone (Boschman et al., 2014). The Lesser Antilles subduction zone likely formed by inversion of a STEP fault that accommodated the northward retreat of the Hispaniola slab after that slab decoupled from the Venezuela slab (see also van Benthem et al., 2013). 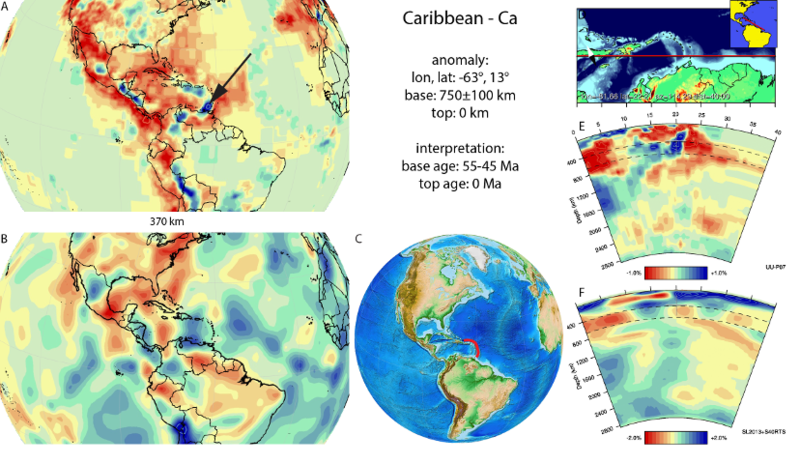 This may explain why the Caribbean slab is not physically connected – at least in its central portion – to these two deeper slabs (Boschman et al., 2014). Based on the reconstruction of Boschman et al (2014) and the onset age of the Lesser Antilles arc, we adopt a 50±5 Ma age for the base of the slab.